InnerCity Weightlifting is a non-profit that works with Boston’s at-risk youth, providing career, academic, and social opportunities through fitness. They empower young people with the confidence to say no to violence and yes to opportunity. The Training Room is excited to host our first fundraiser for ICW on Saturday, January 24th. We are offering FREE online sign up for all TR classes from 10AM to 1PM. Donations for ICW will be accepted at the event. Something Gud, a local farmer’s market delivery service, will also be on site. 10% of all Something Gud sales will go to benefit ICW. Please visit www.innercityweightlifting.org to find out more about how you can help reduce violence in Boston and change lives. DON’T FORGET! THE FIRST CLASS OFFERED AT 373 WASHINGTON STREET WILL BE CYCLING WITH MAREN AT 6AM ON MARCH 1ST! SIGN UP BEFORE 2.15.13 AND GET 20% OFF!! Take one last look at the old roof (and the blue sky that has recently replaced it) before the new one is built next week! We can’t wait to show you what’s in store for TR2. Lot’s of construction action in the weeks to come… stay tuned! Come experience The Training Room’s signature class! This 60-minute class combines 30 minutes of spinning with 30 minutes of metabolic circuit training. Sign up and reserve your space now as this class is limited to 10 participants. On weekdays the class is held in the studio, and on weekends the entire facility is reserved for this class so all participants will get to take advantage strength circuits on our main fitness floor! Price per class is $15. TR cross-training is now included in our regular indoor studio class packages. Sign up now. At The Training Room, we support healthy eating habits and consistent exercise routines- and most of all, we support BALANCE and moderation in all things. That’s why we are excited to give a shout out to the upcoming Fluff Festival in Union Square. Swing by and enjoy a reasonably portioned taste! Afterwards, head over to The Training Room and burn off those extra calories… 40 calories in a 2Tbs serving, to be exact! Although we do not support a steady diet of Fluff or other marshmallow-related products, we do support the local community. Eat Smart! This year, on Saturday, September 24th, Union Square Main Streets will present the Sixth Annual “What the Fluff?” Festival in Union Square, Somerville to honor Archibald Query, who invented this delicious “fluffy” spread right here in Union Square in 1917. There will be food, games, entertainment, even a celebrity appearance by Susan Olsen, or ‘Cindy’ as many know her, from the Brady Bunch. And there’s still time to enter the Fluff cooking contest, which boasts some top prizes, including a tour of the factory (a rare treat)! Leave a comment below telling everyone why you love Fluff – and be creative! 1 comment per person. If you have a twitter account tweet about it to @WickedGoodTravl and use the hashtag #FluffFest. Leave me a comment letting me know if you did! I’m looking for unique recipes, short prose (5 sentences or less), or poems, or those fun little things called haikus, and even vlogs (short videos, 5 min or less, that you’ve uploaded on YouTube- such as making a recipe or a video montage) all proclaiming your love for Fluff. One lucky winner will get a free Fluff tote bag (pictured above). Another lucky winner will receive a gift certificate for 2 free studio class at The Training Room in Somerville, MA. What better way to work off all that fluff you’ll eat testing recipes and at the festival? All winners will be celebrated and featured on Wicked Good Travel & Activities, Somerville Patch, and Union Square Main Streets! You have until September 12th to submit your comment below and I’ll email the winners that week and they will be announced to everyone on Friday, September 16th. We look forward to your comments as well as seeing you on September 24th to join in all the fluffy fun! The Training Room plans to celebrate its second-year anniversary with a “block party” event on Saturday, July 23rd from 12 PM to 4 PM. The event will be held along the Somerville Ave./Elm St. parking corridor, located in front of the facility at 691A Somerville Avenue. Attendees will be encouraged to take advantage of the free fitness classes, demonstrations and screenings that will be offered by The Training Room staff and Physical Therapists, Lorna Brown and Keith Foley from the Cambridge Spaulding Center for Rehabilitation. Training Room co-owners Heidi Brown and Maren Kravitz hope to continue their efforts in helping the City of Somerville to stay among the fittest cities in America. ***Advance signup is recommended for bootcamps, yoga, cycling and foam rolling demos, as space is limited. Humans have engaged in endurance running for millions of years1, but the modern running shoe was not invented until the 1970s. For most of human evolutionary history, runners were either barefoot or wore minimal footwear such as sandals or moccasins with smaller heels and little cushioning relative to modern running shoes. We wondered how runners coped with the impact caused by the foot colliding with the ground before the invention of the modern shoe. Irene Davis’ work on barefoot running has recently brought her to Cambridge, and we are excited to hear her present at The Training Room on April 20, 2011 at 6:00pm. This event is free and open to the public, and we encourage Training Room clients and runners of any kind to come hear her talk. The presentation will consist of lecture, followed by a Q&A and a practical running demonstration. Space is limited, so you must sign up for this free event here. Cycle for Life at The Training Room – Save the date! Please join TEAM G as they host a charity Spinathon at THE TRAINING ROOM to raise money for the 3rd Annual Bicycles Battling Cancer Ride. http://community.acsevents.org/site/TR?fr_id=34536&pg=entry. Unite with fellow cyclists and the American Cancer Society in our effort to save lives and create a world with less cancer and more birthdays. With this event, we’re hoping to help people stay well and get well, raise awareness and funds, and contribute to finding cures and fighting back against cancer. Team G was formed in honor of a cycling enthusiast who recently lost her battle with cancer. Options- to participate, or just come by and donate. Where: THE TRAINING ROOM691a Somerville Ave.
Spinathon participants can ride any length of time – from 1/2 hour to 4 hours. Suggested donations: $15 for each 1/2 hour slot, $25 for each hour.Checks are to be made directly to the American Cancer Society. Bikes are limited so register early! Event day registration welcome if slots remain open. To pre-register: Go to www.thetrainingroomboston.com, click RESERVATIONS, scroll down the class calendar for the May 7th event, and then pick any 30 minute segment (you’re welcome to sign up for as many time slots as you’d like). If you have registered for a class at The Training Room before, just sign in with your username / password and if you haven’t, create an account (just follow instructions listed). Together, we can contribute toward a world where cancer doesn’t steal another year from anyone’s life. 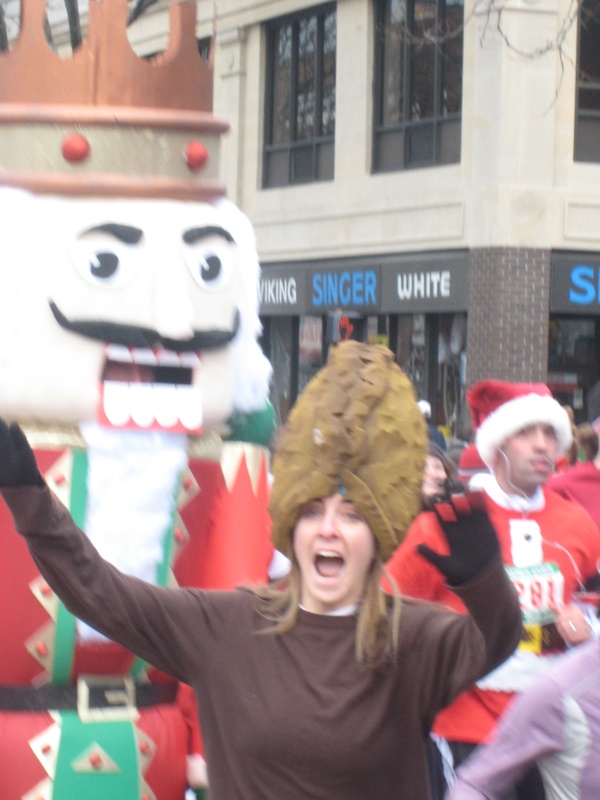 Standing almost 9 feet tall, The Nutcracker (TR client Ryan D.) chased a crazy Nut (Co-Owner Maren) along the 3.1 mile Jingle Bell Run through Somerville. Luckily, the Nut was able to blend in with the 6,200 runners, weaving her way to the finish line before getting cracked open. Ryan, a graphic designer, with a keen eye for developing life-size costumes out of foam and other various materials has successfully participated in the last three Jingle Bell Runs. Dressed as a Giant Ginger Bread Man (2008) and a Towering Snowman (2009) – Ryan is becoming a local legend at the annual Jingle Bell Run. Snapping pictures before, during and after the race, The Nutcracker was a hot commodity. Requests for pictures came from runners, spectators and even families that seek out Ryan for their yearly photo-op. I am sure Ryan’s wife Kelly (pictured above on the left) is thankful that her hubby creates one heck of a costume that doubles as a fantastic holiday card. Happy Holidays from The Training Room.